The first full report from the team that discovered the patterns of adult development, this breakthrough study ranks in significance with the original works of Kinsey and Erikson, exploring and explaining the specific periods of personal development through which all human begins must pass--and which together form a common pattern underlying all human lives. Daniel J. Levinson, a psychologist, was one of the founders of the field of positive adult development. Levinson's two most prominent publications were his series of books entitled, The Seasons of a Man's Life and The Seasons of a Woman's Life. Although controversy surrounds his publications, both books remain promising and highly influential within the field of psychology. Levinson died in 1994 shortly after finishing The Seasons of a Woman's Life which was then published in 1996. 5.0 颗星，最多 5 颗星Important book that should be required reading for every young man. Retired now but my work was consulting men in the workplace most of my life. I discovered this book not long after I began my career, and it was helpful beyond measure. So many of the deeper issues that men face (and being men, usually alone) are addressed and made easier by this book. Easier because it gives the reassurance that you are not alone, you are not crazy, and in fact you are healthily developing into the mature man you are meant to be. The reassurance has power because the book is the result of very professional social science research carefully executed over a remarkable swath of time. Robert Bly says "Men are deep." Levinson demonstrates the truth of that. He further makes the concepts of male development accessible and understandable. His premise is not that men are broken, and therefore need fixing, but rather that male behavior can be understood developmentally, as they pass through their predictable phases of growth. I especially recommend this book to every woman who has a man she feels must change. 5.0 颗星，最多 5 颗星Great book. Bought 3 so our sons could each have a copy. Great book. Bought 3 so our sons could each have a copy. 5.0 颗星，最多 5 颗星Great guidelines for ageing with satisfaction. 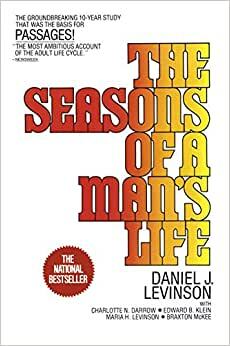 It is a very comprehensive explanation of the natural changes men go through as they age, and the changing roles that bring enjoyment and fulfillment at every stage. It helped me avoid anxiety as my age-related abilities changed.